Bharati Vidyapeeth Deemed University Management Aptitude Test 2017: Bharati Vidyapeeth Deemed University every year conducts entrance exam for to new session undergraduate students. Bharati Vidhyapheet is a deemed university which provides education in the bachelor of Business Administration (BBA). Bharati Vidyapeeth University Management Aptitude Test 2017 is the entrance exam to get admission for undergraduate students in BBA. Interested candidates can apply online application form before last date. Students who have desired to get admission in Bharati University will be passed in Bharati University Entrance Test. Students should be passed in 12th class standard or higher secondary or intermediate class standard with minimum 50% aggregate from well known university/board. Firstly students need to visit the official website and click on apply online. Fill all the compulsory details without any mistake. Upload new or recent student’s photograph and signature. Pay the online application fee via credit card, debit card and net banking. Save anywhere filled application form for use ahead. Total no. of questions will be 200. All questions will be multiple choices or objective types questions. Total duration time will be 150 minutes or 2 ½ hours. All question will carry or equal mark. 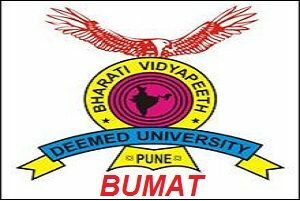 BUMAT 2017 Admit Card: Students who have applied for the application form their BUMAT Admit Card are available now. Candidates can check download the admit card from the website. Aspirants to check admit card required to mention their details like name, roll no, the application from no and other required entries. Candidates without admit card will not attend in BUMAT Exam Center. BUMAT 2017 Result: After Entrance Exam University declared the BUMAT Result. The BUMAT Result for those candidates who applied for the application form. Candidates can see their result on the website by mention details like name, roll no. Only passed students in entrance test will be qualified for admission and other student’s admission will be canceled. The Result of BUMAT will shortlist students for the admission. BUMAT Merit List 2017: The candidates have to qualify the cut off of the BUMAT 2017 and those who clears the BUMAT Cut Off 2017, their names will be displayed on its official website. After shortlist candidates will be called for documents verification. If any students do not have legal documents that types of student admission will be canceled. If any students do not appear in counseling process their admission will also be canceled. After the result, students will be called for BUMAT Counseling Process which is conducts by Bharati Vidyapeeth University (BVU). Only shortlist candidate from entrance exam will be called for the counseling process. Counseling process of BUMAT will be based on given below pattern. Students need to register first counseling process at University campus. Counseling process will be announced merit list for the shortlisted candidates.